A study area is a must when you have children or you are attending school or college. This area should provide you desk, chair, task lighting, work space and storage area. If close work is going to be done at the desk, task lighting is a must. A good light source is advisable even if all of your work will done via a computer to avoid unnecessary eyestrain. Depending on the type of studying you'll be engaged in, you may not require a large desk or work area. Be sure that the desk you choose can accommodate with enough work space. If you're an art student or drafting/architecture student, you may want an appropriate work table. A comfortable chair is a must for any study area. This may be nothing more than a recliner where you can sit with your tablet or laptop. You may decide that a work stool fits your needs better or perhaps an ergonomic chair, especially if you spend several hours at a desk. If you have equipment, tools and supplies necessary for your studies, you need to provide space for these. This can be something as simple as a rolling cart or a cubby shelf with baskets or plastic containers. Most homes don't have enough additional space to create a separate study area. A bedroom is often the most logical choice since it's a personal space and offers greater privacy, but there are also a few other areas that you may be able to use within your home. There are many ways to add a study area in a bedroom. A study area in a bedroom is not the most ideal, but for large families, it's best for each child to have a desk and chair in their bedroom to ensure a quiet space to concentrate. 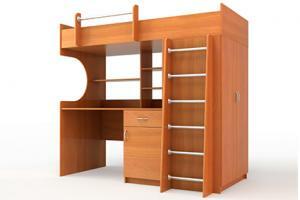 There are several great solutions for limited space in a bedroom to provide an ample study area. A loft bed with a desk and shelves underneath adds functional style to a bedroom design. A desk with a hutch is a great way to give storage space for books and other supplies. A corner desk with built-in shelving system can add needed work space without taking up a lot of space. In the bedroom, hang up personal photos, kids' artwork, and shadow boxes to personalize and decorate the space above the desk. Some homes have niche areas that are ideal for setting up a study space. Some modern kitchens have built-in desk that you may be able to commandeer. An alcove off of the kitchen may provide an adequate area for a small desk. Areas like this are ideal for a floating desk that attaches to the wall. Some also fold up into a wall cabinet and are great space-savers. This type of desk is especially good if you live in an apartment where space is a premium. 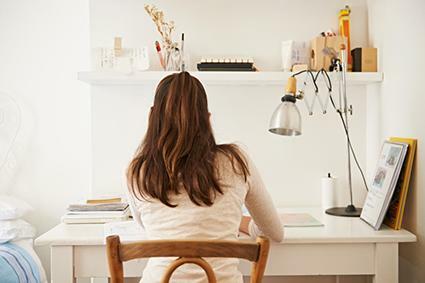 Keep decorative elements, like art or desk sculptures, to a bare minimum to keep from intruding on the room's purpose. 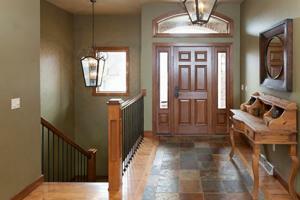 A staircase landing may be large enough for a desk and chair. Add a small decorative table lamp for lighting that matches the wall colors or nearby furniture styles. 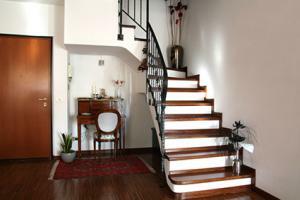 Another area that might work is underneath an open staircase or beside one, especially if the staircase turns on a landing. Often a closet is located underneath a staircase and with a little imagination, this can be turned into a small study area by removing the door and adding a desk or having a desk built-in with shelving surrounding it on the interior three walls. 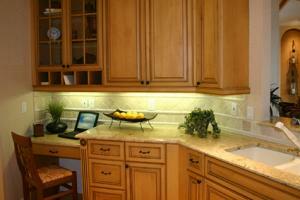 Overhead cabinets can be added, so that the finished look is a recessed area designed specifically for study and work. Add a small area rug and a chair. A couple of wall sconces will give light without taking up desk space. A foyer may be your only choice for a study area. Just be sure that the desk and chair you use don't interfere with the traffic flow in and out of the home. Match the desk to the style of the foyer and it will look natural. A closet in another part of your home might be an ideal place to set up a study area. This is especially advantageous if you have a double size closet with folding doors. You can then simply close the doors and not have to worry about cleaning up the desk area between study sessions. As the door can be closed, you can decorate as you please, but make sure to include lots of lighting since closets rarely have windows. If the family den is the only place available for a study area, then choose the quietest corner. A corner desk will fit nicely in such a space. Another alternative is a small secretary that has a drop down desk leaf. 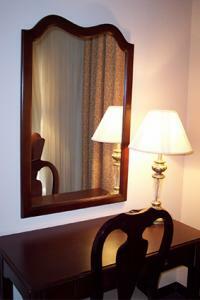 If sitting with your back to the room is distracting, place a folding screen, such as a shoji or decorative screen. Even a tall houseplant can be used to provide full or partial screening. A guest room may be your best option for creating a study area. If you have very few guests, you can convert the room into an office and provide either a futon, sleep couch or a murphy bed wall unit for guests. There's no point in wasting a space for a function that it is rarely used for. Infrequent overnight guests won't disturb your study space and you can have enough space to do your work comfortably. Add a bookshelf and file cabinet to complete your transition into an office area. If you have a spare room that can be completely dedicated to study, then you have a super opportunity to make this a special place for your family to study together or individually. If you have children, then you want to provide each with a desk and chair. If adults will also be using the room, provide a separate desk area for them at the other end of the room since the desk will need to be larger and the study times may vary amongst household members. Design this room as you would any other room in your home but pay strict attention to meeting the needs of a dedicate study room. Weekends might find the entire family in the room. Use stimulating colors in the room decor, such as red, orange, yellow, pink, purple and other hues of warm colors. You don't want the room to feel comfortable like a bedroom. Decide on your color scheme and style. Add individual task lamps for each desk. Install recessed lights on a dimmer switch for additional light on cloudy days and night studying. If room allows, provide a sofa, sectional or bean bags for a relaxed seating area. This is important since desk sitting can compress the back and it's good to have another space to sprawl out to work on a laptop or tablet. If natural light if abundant, then use blinds to help direct the light during certain times of the day. Don't place a television in this area, unless it's needed for study reasons. A television can be a distraction and interfere with the purpose of a study room. A carpeted room will help reduce the noise level and be an acoustic ideal that will aid concentration. Area rugs can help muffle the sound of tile or hardwood floors. Wallpaper and wallcoverings are also good for sound reduction. Be sure that your study room has ample electrical outlets for lamps and computers. A bookcase can hold needed text and reference books, although many will be used via a tablet or laptop screen. Still, a bookcase is always a nice addition to any study room. If anyone in your household is an art student you may need to accommodate home projects with a large work table and other specific equipment. You want your study area to be attractive and blend with the rest of room or house, yet it should also reflect your taste and personality. You may decide to use ultra modern furniture or perhaps instead of a desk chair a balance ball is more your style. You can paint your desk with chalk paint or stencil a cool motif on it to make it reflect your design sense. Whatever style and design you select for your space, be sure that it's comfortable and enjoyable so you'll want to study there.